Virale wasn’t an accident though I certainly had no idea it would manifest like this. Every single day for nearly a year I photographed myself getting dressed. Selfies on steroids, I thought, believing that image can drive reality and knowing my own reality wasn’t so groovy. I felt terribly silly taking each picture but I did have a modicum of hope that these photos would one day just be a narcissistic byproduct of something larger. Occasionally I reviewed the photos, identified weaknesses, and thought about how I could make my image more interesting at least, more arresting at best. Strange thoughts for a research scientist/bureaucrat, yes? Enter the asparagus bow tie. As the ties would come in I was generally disappointed in the craftsmanship. But by happenstance, I stumbled upon an asparagus bow tie on Etsy. I ordered it and it arrived quickly and it was perfect. I immediately made arrangements to send more fabrics to Maine, one of the few states I’ve never visited. Two of these ties changed everything (actually 3 ties but I need to keep the gospel-Harlem-Bollywood story for myself). Tie #1: I wore it in Seattle last June. It was a subtle pink and blue impressionistic background of flowers punctuated with razorblades. The response to it by total strangers was remarkable. However, the response to the second tie a week later in New York City was utterly overwhelming. The next day I finished my work commitments (a conference and Brooklyn) and ran out of the building. I dumped all my conference materials in a trash bin outside the hotel and walked across the Brooklyn Bridge in the rain and kept walking… And walking… And walking. I eventually found myself in the garment district looking for tie fabric. Then I thought, up the ante; make your own designs. Each tie is from a very limited edition and is custom printed, numbered and custom made specifically for you. These are truly unique ties. Many of the bow ties can be tied two ways, creating two different but related looking bows. Designed in Little Rock, Arkansas, printed in North Carolina, and made in Kennebunk, Maine by Lisa Eaton of bowtie.com. VIRALE by Dr.B.---CATCH IT. WEAR IT. SPREAD IT. • Fabric orders for VIRALE bow ties will be placed by midnight on the 15th of each month. 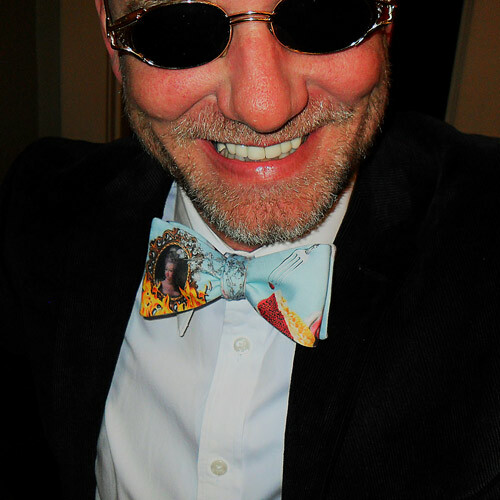 Turnaround time for these numbered, custom printed, custom made bow ties can be 3-5 weeks. The finest bow ties. Handmade In Maine.